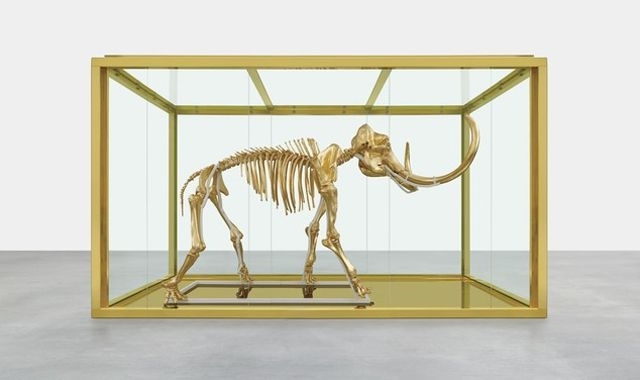 Damien Hirst has created a gilded woolly mammoth skeleton which will be auctioned at the annual amfAR Cinema Against Aids gala this Thursday in Cannes, France. Entitled Gone but not Forgotten, the piece is three metres high and encased in a gold tank. It is in a similar style to his most famous works of animals preserved in formaldehyde. His work The Physical Impossibility of Death in the Mind of Someone Living, which propelled him into fame, saw a real tiger shark displayed in a large vitrine. Gone but not Forgotten is a far more opulent piece, reflecting Hirst's status as Britian's richest artist. In the Sunday Times Rich List, published yesterday, Hirst has a total wealth of £215 million, making him £80m richer than collector Charles Saatchi, worth £135 million. The mammoth creation will raise money for amfAR, the charity dedicated to fighting AIDS through research. Items which have been auctioned at previous amfAR events include a trip to space with Leonardo DiCaprio and a kiss from George Clooney.